This Unique and Stylish kneeling pad with Extra Large 1.5 Inch thickness will That You're Guaranteed to Love! Whether you're addicted to gardening, yoga, exercise, garage works, indoor, outdoors, camping and more, this gardening pad has got you covered. This kneeling pad provides maximum protection and features a 1.5 Inch extra-thick high-density foam. It will be helpful for your everyday tasks, and allows you to finish those chores effortlessly. Kneeling while gardening and performing every day activities can be made much less painful when using our 1.5 Inch thicker kneeling pad. We've designed our gardening knee pads of high density foam that is simple to use while providing a soft surface for you to kneel or sit on. Our mat is thicker than others on the market, giving you greater comfort and value whether you use it for sitting or kneeling. 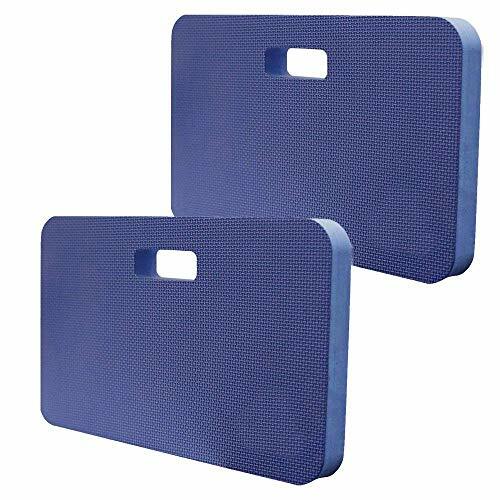 Kneeling pad is a high density foam mat made using EVA foam, includes a cut-out handle to make transport simple, and is moisture proof. Foam pad will dry quickly when washed, and won't mildew or retain germs. Foam is safe, odor free, and eco-friendly. 100% Satisfaction Guarantee We will replace your kneel pad or offer a full refund if for any reason you aren't completely satisfied! Click on the Add To Cart button to order this Premium Heavy Duty Kneeling Pads Today! MULTI-FUNCTIONAL KNEELER - It's great for gardening and for baby bath time, household chores, exercises and yoga, camping, sport events, home installation and repair, auto repair, and perfect for tradesmen of all kinds including floors, plumbers, painters, carpenters, mechanics. If you have any questions about this product by Dimple, contact us by completing and submitting the form below. If you are looking for a specif part number, please include it with your message.